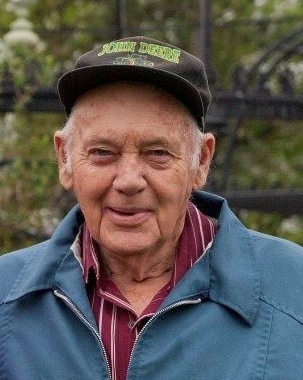 Norman Reinbold, age 87 of rural Long Prairie passed away at his home on Thursday evening, December 6, 2018 with his family by his side. On October 28, 1931 a son was born to Joseph and Amanda (Voight) Reinbold in Reynolds Township, Todd Co., MN and they named him Norman Leslie. He grew up on the family farm and attended country school. He loved farming and life in the country and continued to farm his entire adult life. On December 19, 1951 Norman was married to Letitia Jane Robinson at the First Baptist Church in Long Prairie. They lived and farmed in Todd County west of Long Prairie on County 36. Norman also worked for the Reynolds Creamery for many years hauling canned milk. Norman loved working with his farm animals, especially the cows and always had a good farm dog close on his heels. He loved watching his children and grandchildren grow. He also attended their sporting events and enjoyed playing card games when they were over for a visit. Norman also enjoyed listening to music at any event he attended, including fairs, festivals, and threshing bees. He always had the radio tuned to his favorite country stations. Norman loved his family and was so appreciative of their help in allowing him to spend his final days on the farm, especially the care of Chuck, Connie, and Carolyn which made this possible. He is survived by his children, Bob (Susan) Reinbold of Henning, MN, Paul (Fran) Reinbold of Long Prairie, Connie (Chuck) Sukola of Prior Lake, MN, Joseph (Luanne) Reinbold and Carolyn (Donnie) Middendorf, all of Long Prairie; 15 grandchildren; 6 honorary grandchildren; 22 great grandchildren. Preceding him in death are his parents, his wife, Jane in 2014; 3 grandchildren, Becca Sukola, James & Andrew Reinbold; daughter-in-law, Janice Reinbold and sister, Doris Van Valkenburg.